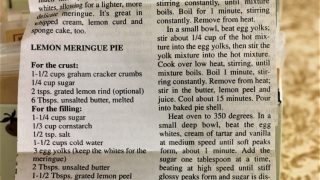 Front of the recipe card for Lemon Meringue Pie. 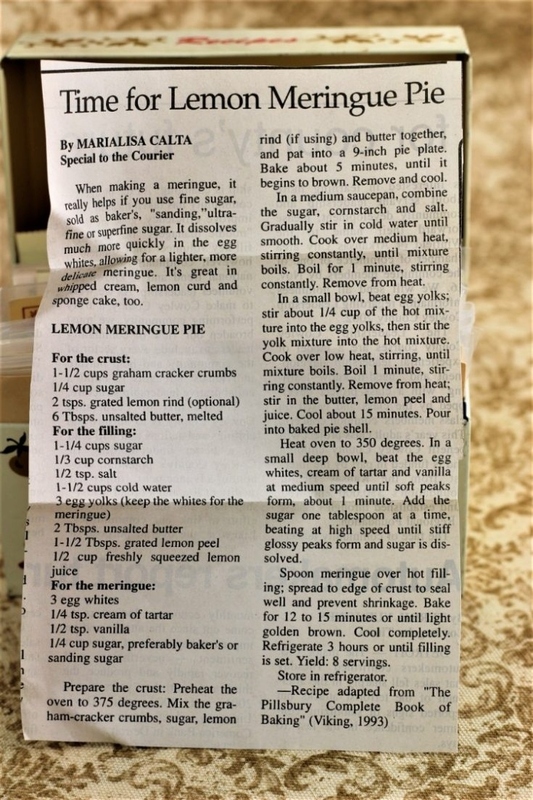 There are lots of fun recipes to read in the box this recipe for Lemon Meringue Pie was with. Use the links below to view other recipes similar to this Lemon Meringue Pie recipe. If you make this Lemon Meringue Pie recipe, please share your photos and comments below! Prepare the crust: Preheat the oven to 375 degrees. Mix the graham-cracker crumbs, sugar, lemon rind (if usign) and butter together, and pat into a 9-inch pie plate. Bake about 5 minutes, until it begins to brown. In a medium saucepan, combine the sugar, cornstarch and salt. Gradually stir in cold water until smooth. Cook over medium heat, stirring constantly, until mixture boils. In a small bowl, beat egg yolks; stir about ¼ cup of the hot mixture into the egg yolks, then stir the yolk mixture into the hot mixture. Cook over low heat, stirring until mixture boils. Remove from heat; stir in the butter, lemon peel and juice. In a small deep bowl, beat the egg whites, cream of tartar and vanilla at medium speed until soft peaks form, about 1 minute. Add the sugar one tablespoon at a time, beating at high speed until stiff glossy peaks form and sugar is dissolved. Spoon meringue over hot filling; spread to edge of crust to seal well and prevent shrinkage. Refrigerate 3 hours or until filling is set.